From the bestselling author of the Shopaholic series comes a story of humour, heart and heartache. 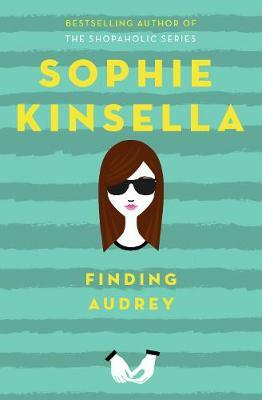 Finding Audrey is Sophie Kinsella's first novel for teens, sure to appeal to her legions of adult and young adult fans all over the world. Audrey can't leave the house. she can't even take off her dark glasses inside the house. Then her brother's friend Linus stumbles into her life. With his friendly, orange-slice smile and his funny notes, he starts to entice Audrey out again - well, Starbucks is a start. And with Linus at her side, Audrey feels like she can do the things she'd thought were too scary. Suddenly, finding her way back to the real world seems achievable. Be prepared to laugh, dream and hope with Audrey as she learns that even when you feel like you have lost yourself, love can still find you . . .
British author Sophie Kinsella made her name with the first novel in her Shopaholic series, The Secret Dreamworld of a Shopaholic. Since then that novel’s heroine, Becky Bloomwood, has gone on to star in seven more novels. Since then Kinsella has gone on to write popular stand alone fiction including: Can You Keep A Secret?, The Undomestic Goddess, Remember Me?, Twenties Girl, I’ve Got Your Number, Wedding Night, My Not So Perfect Life and Surprise Me. Kinsella also writes fiction under her real name of Madeleine Wickham. Fantastic book. I love how Sophie Kinsella has tackled such a difficult subject, mental health.